I was in Bratislava, Slovakia last week, which you may know if you happen to follow me on Facebook. It was a business trip of course, but I was able to find a little time to get out and shoot this beautiful city. In particular, I was very happy to be able to meet up with my friend Miroslav Petrasko, who runs the HDR photo blog called HDR Shooter and is a fabulous HDR photographer. Locals always know the best spots, and he was kind enough to hang out for a while and take me up to the highest spot around, where we got this amazing view of the Bratislava Castle, the Old Town, and St. Martin's Cathedral. 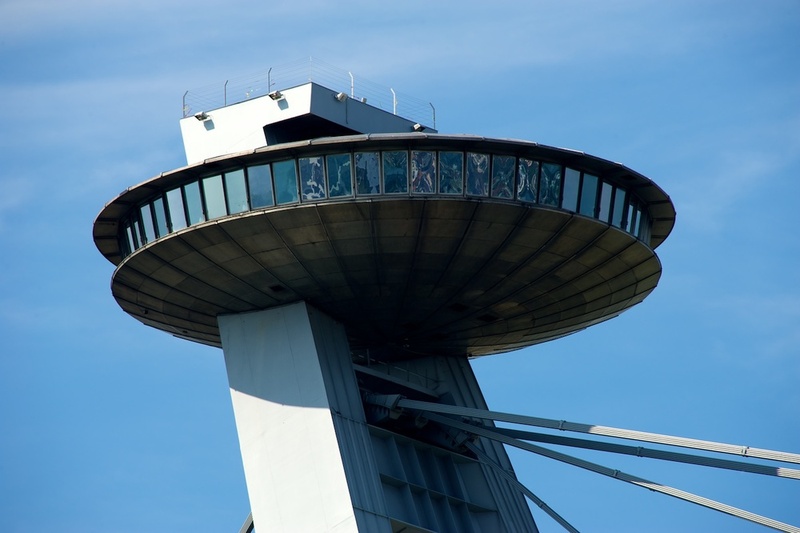 Here's a quick snap of the structure we were shooting from...it's a restaurant called UFO and sits atop the New Bridge. 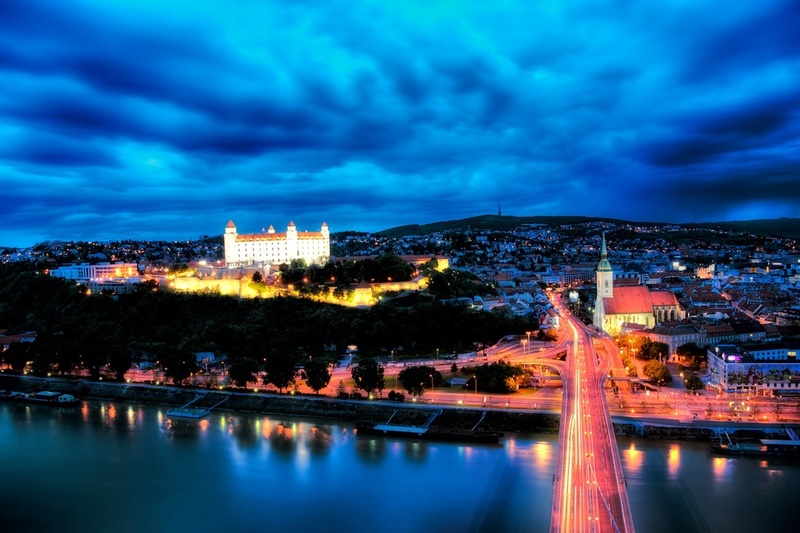 It's a bit of a strange sight, considering Bratislava is very historic-looking, but you can't beat the views! The river you see is the Danube - one of the historic and famous European rivers. 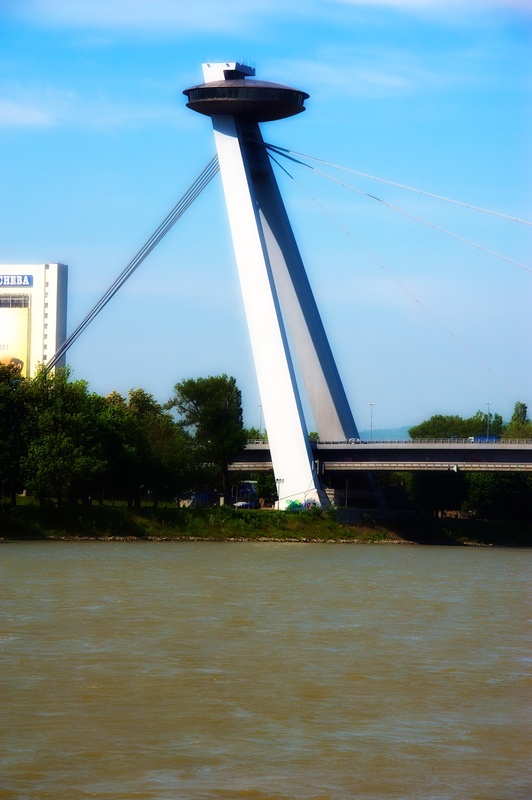 Bratislava is a beautiful town. It's not big enough to be overwhelming (like say, London - which is a great city, but it's HUGE and you can never see it all) but it is big enough to give you plenty of interesting things to shoot over a few days. I took about 1500 photos there - so there is a lot to shoot. It has a lively culture, beautiful architecture, and lots of interesting back streets that are fun to explore with a camera. Lots more to come! One last shot - a close-up of UFO. You can see the rooftop deck - that's where we stood, aiming our lenses out through the wires, firing brackets into the night! It was awesome!! Thanks Miroslav!